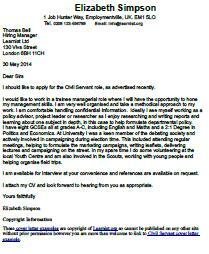 Cover letter example for a Civil Servant. Amend as suitable and start applying for Civil Servant job vacancies. I should like to apply for the Civil Servant role, as advertised recently. I would like to work in a trainee managerial role where I will have the opportunity to hone my management skills. I am very well organised and take a methodical approach to my work. I am comfortable handling confidential information. Ideally I see myself working as a policy advisor, project leader or researcher as I enjoy researching and writing reports and learning about one subject in depth, in this case to help formulate departmental policy. I have eight GCSEs all at grades A-C, including English and Maths and a 2:1 Degree in Politics and Economics. At University I was a keen member of the debating society and actively involved in campaigning during election time. This included attending regular meetings, helping to formulate the marketing campaigns, writing leaflets, delivering lectures and campaigning on the street. In my spare time I do some volunteering at the local Youth Centre and am also involved in the Scouts, working with young people and helping organise field trips. View more cover letter examples.